Video is the most versatile and self-sufficient engagement medium currently available to businesses. It can enlist investors, entice customers, and convince critics. Forrester research fellow James McQuivey found that one minute of video is worth 1.8 million words, and marketing researchers have proven time and again that video can sell, motivate, educate, and mobilize. 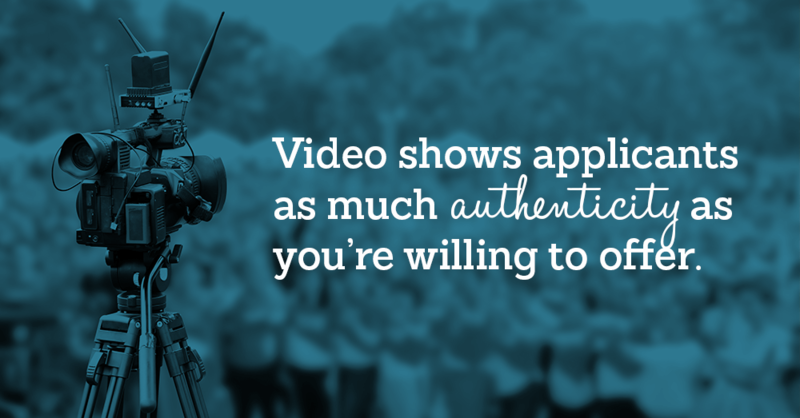 Video doesn’t just replace the written word in recruitment settings—video elevates it. Unaccompanied text on the internet isn’t just falling out of fashion. It’s already fallen. Video currently makes up nearly 80% of the entire internet, so any recruitment professional not eating a piece of the video pie is losing a lot of potential applicants. Job postings with video received 12% more views and 34% more applications than postings without. Postings and recruitment strategies accompanied by video perform well and perform consistently, and to job searchers, they clearly add something irresistible to the mix. CareerBuilder notes in a study of their own users that job postings with video received 12% more views and 34% more applications than postings without. LinkedIn—the networking social media site that represents a revolutionary combination of online play and work—goes so far as to say that for businesses to reach significant audiences, “video simply must be an integral part of [their] recruitment strategy.” The simple presence of video may convince prospective employees that a company feels polished, exciting, or genuine—but whatever characteristics video represents for job searchers, the fact remains that it captures their attention. Make the complex simple with the power of video recruitment. Once you harness the power of video in advertising your company to prospective employees, it’s yourchoice how you use that power. Have you been searching for a better way to quickly introduce yourcompany before launching into job position requirements? Craft a company culture video that can be reused for a variety of postings and marketing situations. Do words feel insufficient for capturing the responsibilities of a specific position in the day-to-day? Ask the current position holder, or an adjacent department member, to complete a short interview or demonstrate daily responsibilities on camera. If it’s video versatility you seek, craft a video that includes all the things job applicants desire most: a look at meaningful company rapport, honesty, well-rounded current employees, and a spotlight on growth opportunities. Have your video developers make a video that can be used for a multitude of positions, include it in postings and webpages alike, and you’ll get the most out of your video venture. Video is reusable, succinct, and perfect for demystifying concepts such as workplace culture. It peels back the curtain of your company’s public image and entices prospective employees by what they can contribute to. Reapply the old writing adage of “showing instead of telling” to your recruitment efforts, and let job searchers see what you can offer them… and what you expect of them. Video’s ability to honestly engage viewers decreases the likelihood of wasting your time with wrong candidates. When you use video to weed out unfit applicants—by demonstrating unique aspects of your workplace’s culture, showing the level of professionalism expected, or making common job stressors clear—you improve your pool of interviewees and waste less of your efforts. But beyond keeping interview quality high, video can benefit your applicants, too. Employees who believe in their company’s culture are more motivated, successful, and content; by default, entertaining culture-competent applicants at the beginning of your search makes sure that your new employees will remain supportive of the company they’ve chosen. Attract applicants who would blend flawlessly with your company’s culture by displaying your office in a brief video overview and watching who responds. Tap into settings that are usually unfriendly to job postings. 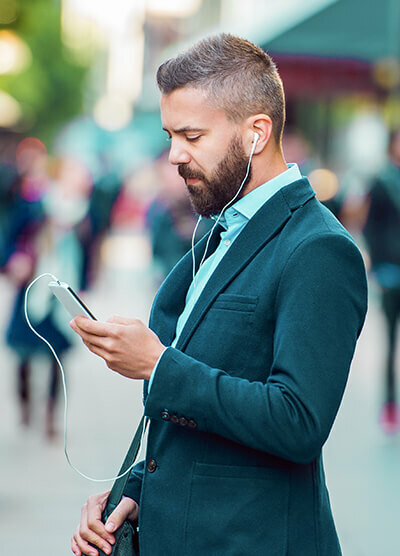 Current cultural fascination with video allows today’s recruiters to capture the attention of more demographics than ever before. Settings where job postings would normally garner disapproval (such as social media sites and multimedia networks) are much more accepting of video marketing. Plug your company in unexpected ways and on unexpected platforms to cast a wider net and find applicants that truly connect with your brand. Remember that transparency is always best: never fake it in your recruitment videos. Studies say the more truthful, the more effective. More than ever, candidates are willing to sacrifice for work they believe in—but you can’t convince a candidate that your work is meaningful if you don’t portray it correctly on their first encounter. LinkedIn influencers recommend creating videos that are honest, unique, and relatable. To appeal to a wide variety of applicants, don’t singularly focus on top executives. And while great videos begin with a script, avoid making your video feel scripted. Instead, brainstorm ways to be honest yet enticing, and unique yet stable. Hit the balance right and tell your company’s story using the right concepts. You’ll soon be on your way to attracting truly interested employees. So you’ve decided to incorporate video into your recruitment—but what kind of video should you create, and how should you produce it? Simply put, your recruitment videos—like your entire recruitment strategy—should cater to the unique needs and match the unique culture of your company. It’s more helpful to think of prospective candidates as investors rather than customers, and proceed from that foundation. Given the opportunity, that’s what new hires are going to be doing with their time anyway: investing energy and effort into your company. Decide how you want applicants to feel about your company before creating your video. And if the creative process surrounding recruitment videos remains mystifying, enlist help from current employees, video creatives, and even current interviewees. Get a feeling for what people want to know about your company, and disclose it creatively through video. And it’s that authenticity, in the end, that’s going to attract the employees you really want. Make sure they see the sides of your company that really matter, and get ready for filming to begin.